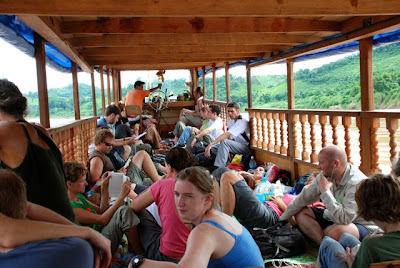 The slow boat down the Mekong certainly lived up to its name. The two-day journey through Laos from Huay Xai to Luang Prabang seemed even longer, the creeping of time accentuated by less than comfortable conditions. Our narrow wooden craft was crammed with people who, like my buddy Wyatt and me, were making the Thailand-Laos loop, armed with dog-eared Lonely Planet guidebooks. In addition to the thirty or forty foreigners, the boat housed an increasing number of locals who literally jumped on board after being ferried to our floating canopied prison. Our discomfort and growing safety concerns were quickly thrust out of mind when the woman from New Jersey loudly declared to her unfortunate seatmate, “I’m not a tourist; I’m a traveler.” There was no avoiding her monologue, “I’m here to experience life. When my second husband left me…” We looked longingly out at the “fast boats” speeding past us. Sure, those helmet-wearing passengers were clearly risking life and limb, but at that point we just wanted out. It didn’t matter whether Ms. New Jersey was a traveler or a tourist; she was inescapably annoying. The topic of the Outside blog entry, written by Porter Fox, was how not to look like a tourist. My first reaction was to quibble with this typical top ten list. Number 9, which recommended leaving sophisticated cameras at home, definitely rankled. Sure, sometimes people let documenting every aspect of a trip interfere with their experience, but cameras can be a great communication aid, especially when you don’t speak the local language. If I hadn’t been able to share my Nikon’s stored photos with the old man sitting next to me at an outdoor darts match in a small village in Bhutan, I probably never would have been able to bridge the silent gap between us. And I hope I’ve brought a small measure of happiness to people, locals and travelers alike, to whom I’ve been able to send photos. Not bring a digital SLR along because it might be a ‘barrier’? “Ridiculous!” I thought, and politely expressed that view in the comments section. After a little more thought, however, I realized that it wasn’t the poor, but well-intentioned, advice about cameras that was ridiculous. It was the whole premise of the list. Perhaps if it had been entitled something like “Ways to get more out of your trip,” or “How to blend in,” the list would have made sense. But “not look like a tourist”? Let’s face it; in most places, you’re going to look like an outsider no matter how you dress or act. You can’t mask certain things – your skin, the way you walk, your comfort level, the fact that you probably only know the five phrases suggested in the article, your accent if you know more than that, and a host of other things. And if something does give away your status, so what? If anything, that can facilitate meeting people, being shown out-of-the way travel gems, trying new things, or experiencing life the way locals do. (Of course, these might not be your goals. I only mention these things because they seemed to be the focus of the article.) Both pairs of my grandparents were inveterate travelers for both business and pleasure. I don’t think they dressed like anything other than "tourists," yet they still managed to meet local people, be invited into homes, be shown amazing things, make life-long friends, and generally have as good and meaningful a time as any other American visitors to the same locale. Mr. Fox’s assertion that “real travel is for wanderers who don’t want to just see, but experience something different” is simply nonsensical snobbery. There’s nothing intrinsically wrong or not "real" with being a “tourist.” You can look and act however you want, call yourself a traveler or world citizen or whatever euphemism you prefer, but you’re still as much a visitor, a guest even, as any other vacationer (and doesn’t that term sound even more pejorative than “tourist”?). The important thing is to have the experience you want; forget about trying to avoid, or live up to, a label. If that means joining bus tours, go for it. If it means living on $5 a day and asking permission to camp on people’s lawns – great. It’s your trip, after all, and either way it’s possible to ‘experience something different.’ Go home having given yourself the opportunity to accomplish what you wanted to. Ironically, I find the extra tip Mr. Fox offers as almost an afterthought, to be his most valuable advice. Taking the time to slow down can be invaluable. Too often people succumb to the temptation to try to see as much as possible of a city or country, instead ending up with bleary memories of a succession of landmarks and hotels or hostels. Pare down your itinerary and, paradoxically, you’ll probably see more. Keep an open mind and some open space in your plans so you’ll be able to take advantage of the spur-of-the-moment opportunities that inevitably pop up. 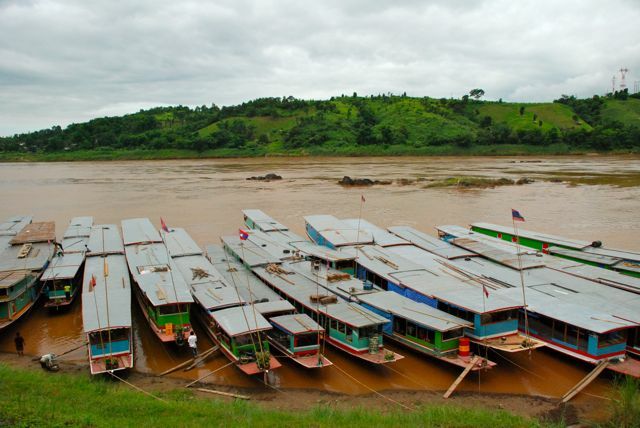 Just don’t take that slow boat down the Mekong if you’re looking for excitement.